Xavier Subirats is partner at AMSEL ASSESSORS SL , an accountancy, tax and management consultancy firm for SMEs. 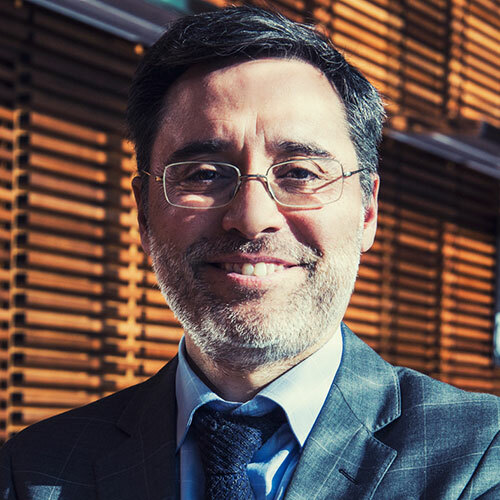 Xavier Subirats is a Master in International Business with executive education on Corporate Finance (London Business School), Boards of Directors & Governance (Harvard-Iese) and Management Development (Iese). Bachelor in Business Administration and Economics. At AMSEL he is responsible for business analysis, management consultancy and Board Services. He attends seven Steering Committees/Boards of Directors in different industries and also the Boards of the Catalan Economists Association (CEC) and the Association for Management Accountancy (ACCID). To help controllers and mid-managers to create better reports/messages by introducing IBCS® principles . To help managers to make better decisions by using management tools and best practices. To help Board of Directors’ value-creation and effectiveness through structured agendas, strategy awareness and independent insights. 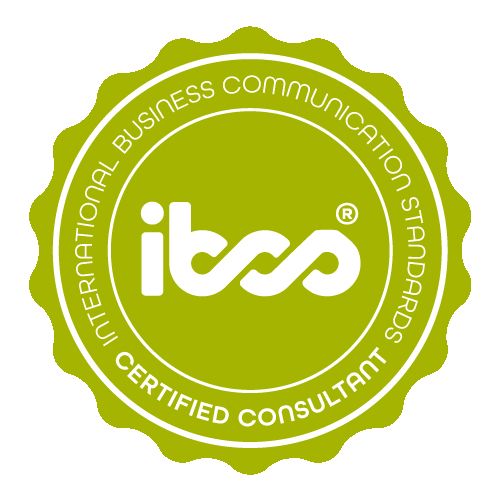 Xavier Subirats has successfully completed the IBCS® certification for successful design of reports and presentations at the HICHERT+FAISST IBCS Institute in September 2016. Sales 2016 Sales of the Company are displayed by month. 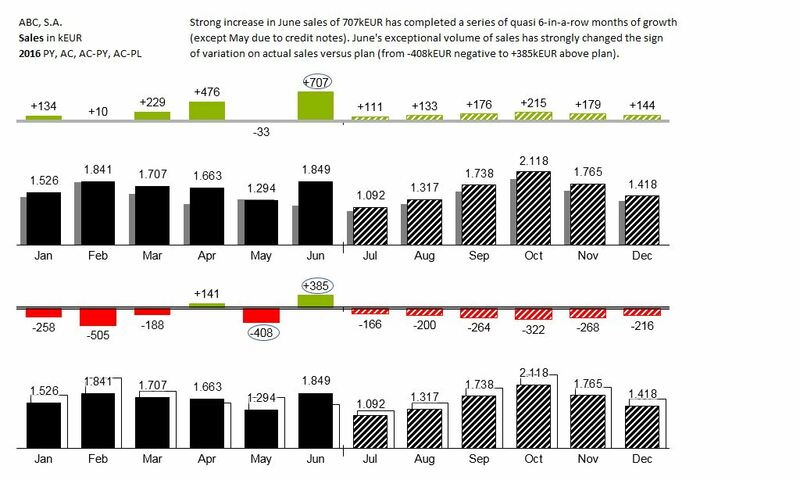 Above : Sales are shown for each month of the year as well as the forecast for the following months. Each of the twelve values are compared with the value of the same month of the previous year. Variances for each month versus same month of the previous year are displayed on top. Below: Sales are shown for each month of the year as well as the forecast for the following months. Each of the twelve values are compared with the value of the same month of the budget. Variances for each month versus same month of the budget are displayed on top. 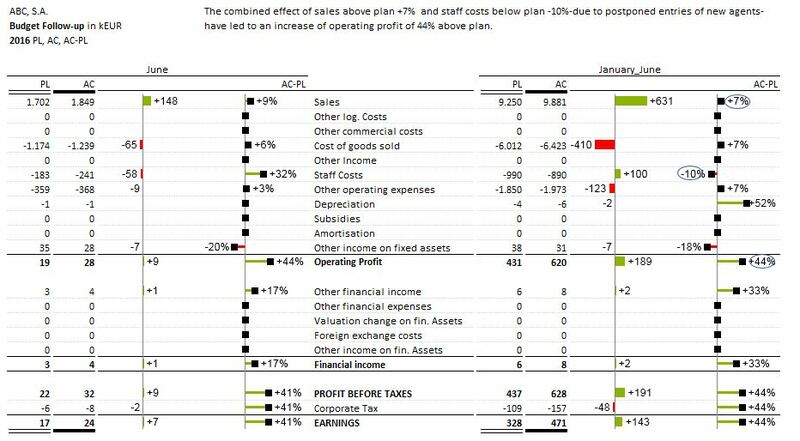 Budget follow-up 2016 On the left hand side: Profit and Loss Table actual values of the specific month are displayed versus plan expected values of the specific month accompanied with a chart of variances, either in absolute and in percentage values. On the right hand side: Profit and Loss Table actual accumulated values year to date until specific month are displayed versus plan expected values of the accumulated values year to date until specific month accompanied with a chart of variances, either in absolute and percentage values . AMSEL ASSESSORS SL is an accountancy, tax and management consultancy firm for small and medium enterprises. With more than 30 years of experience, AMSEL is helping its customers by improving business analysis and the effectiveness of the Boards of Directors.